Bandelier National Monument was proclaimed On February 11, 1916, and transferred from the Forest Service on February 25, 1932. 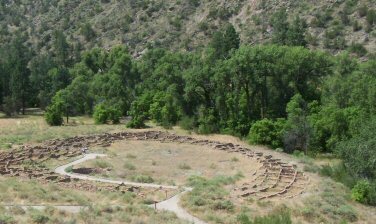 It's a park that cherishes a rich heritage of archaeological sites, homes of the ancestral Puebloans who lived here between the 12th and 16th centuries A.D. Bandelier is located in north-central New Mexico, on the Pajarito Plateau, near Los Alamos. There are trails that give access to crumbling cliffs, forested mesas, and deep gorges, all part of a dramatic landscape created by a huge volcanic eruption more than a million years ago. The cliffs and canyons are formed of 'tuff' -- consolidated volcanic ash that is soft and is more easily carved away than other rock. 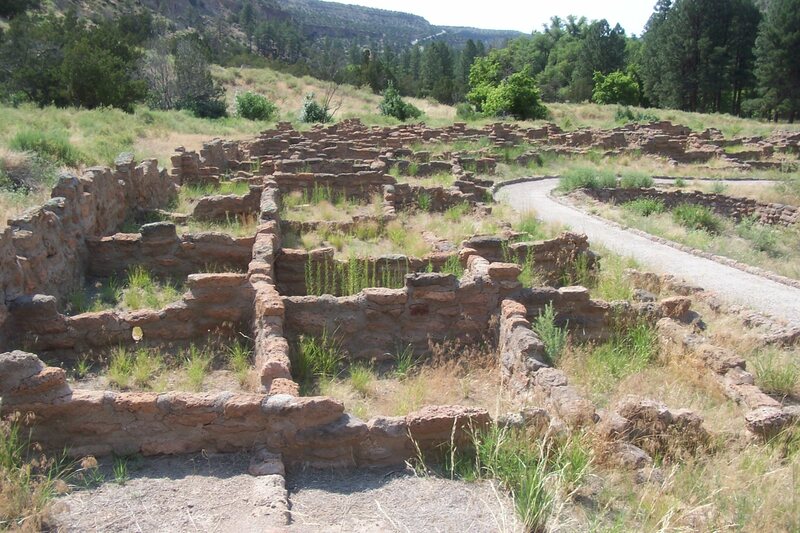 Ancestral Puebloans who farmed in the Pajarito Plateau area had their work cut out for them. The average rainfall is only 16 inches a year, with less than half of that falling in the growing season. The elevation here also is a problem; at 6,000 to 7,500 feet, the growing season is short, and frosts can occur at nearly any time, damaging fragile crops. The soil was both a blessing and a problem. The volcanic soil had the ability to hold rainfall longer than other soils, which benefitted the crops; however, the nutrients are quickly depleted, which required that the farmers let them lay fallow for years before they could be farmed again. The farmers built ingenious contour terraces and check dams, which kept scarce rainfall on the fields longer. It appears that the farmers also planted fields at different elevations, apparently minimizing their risks of crop failure. If one area had a bad season, perhaps another would provide enough food for them to survive the season. However, by the mid-1500's a serious drought occurred in this area, and that contributed to the people moving away from their settlements here. Perhaps the soil had become nutrient-depleted as well, and it seems the people moved out of the Bandelier area, down to the more reliable water source provided by the Rio Grande. 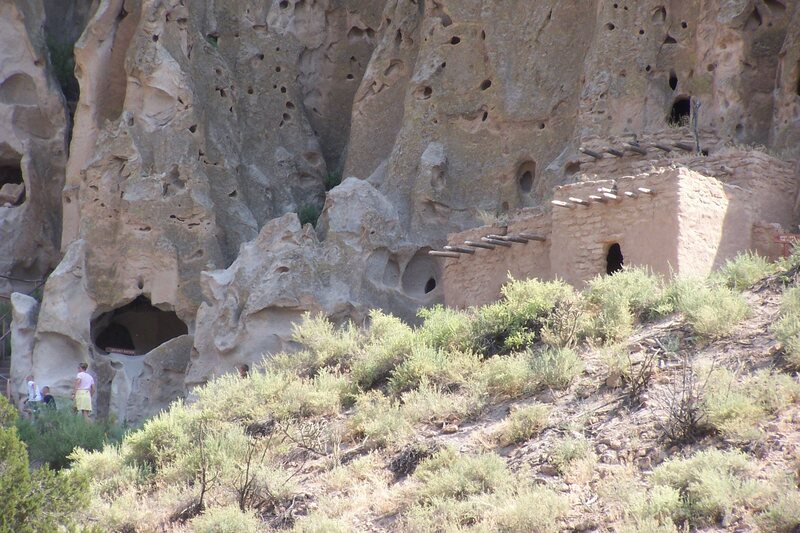 The people who lived here exploited and enlarged the natural holes in the cliff walls for their dwellings. 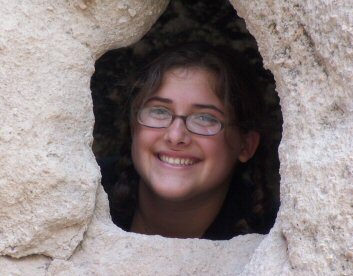 They chose south-facing caves when they could, to take advantage of the winter sun to keep them warm. So, when you take the main loop of the trail, that's what you'll see, as you can see from the pictures. The entire Bandelier site includes trails of many lengths, one of which is the 5-mile round-trip Falls Trail to the Rio Grande. There are other, shorter trails as well but we did take the 1.2 mile Loop walk, which wasn't difficult at all. 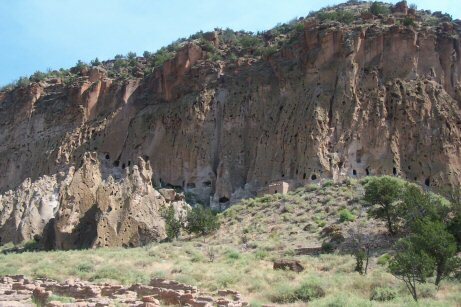 This main Loop trail contains the only excavated sites in Bandelier, including the outlines of dwellings on the valley floor (the village of Tyuonyi), a kiva, and a reconstructed house up near the cliffs. A little stream meanders through the middle of the valley, nourishing trees and providing shade. The Ancestral Puebloans did most of their farming on the mesa tops. Because of the high elevation, the crops need all the sunlight they can get. There were small plots of farmland in the valleys as well, and the farmers built terraces to trap scarce rainfall. 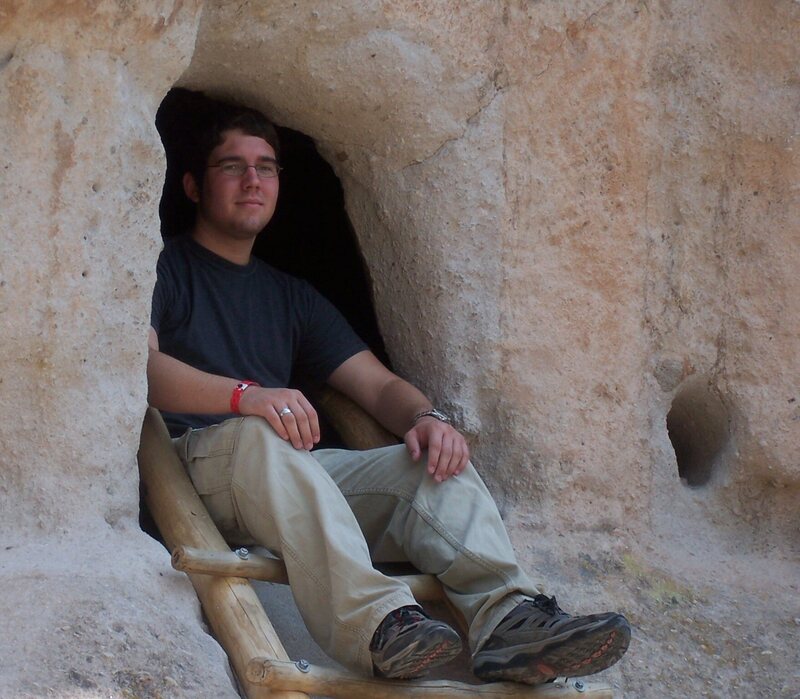 The Tsankawi section of Bandelier is 12 miles from this main section of the park. 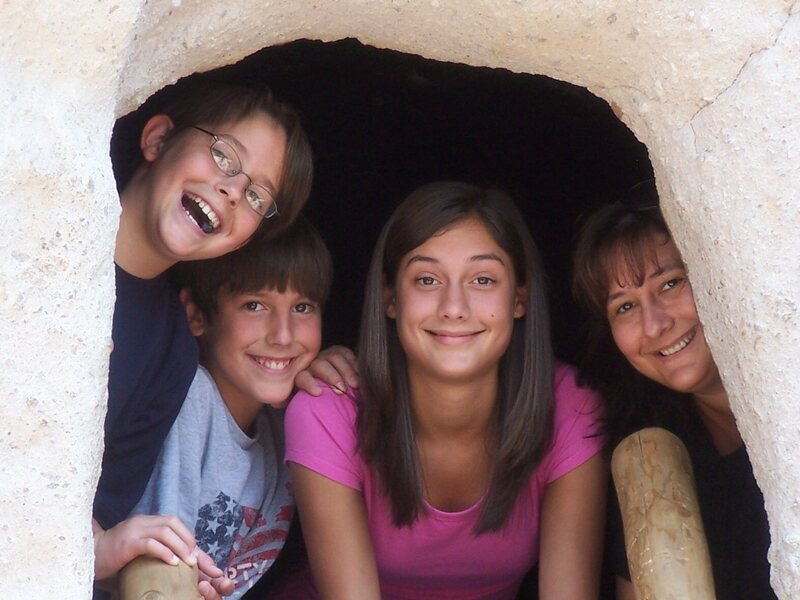 At Tsankawi you can take a 1.5 mile walk along a mesa and see little caves, petroglyphs, and the village of Tsankawi. Apparently you'll need to climb ladders here. There are plenty of backcountry hikes, for those who are interested; permits are required for overnight stays. The visitor center, built by the CCC between 1934 and 1941, has exhibits on Ancestral and historic Pueblo culture. We had time to take the Main Loop trail, which is only 1.2 miles long. It's wheelchair-accessible for most of the loop; there's a place to turn back to make it a 0.75-mile paved Loop if you want. 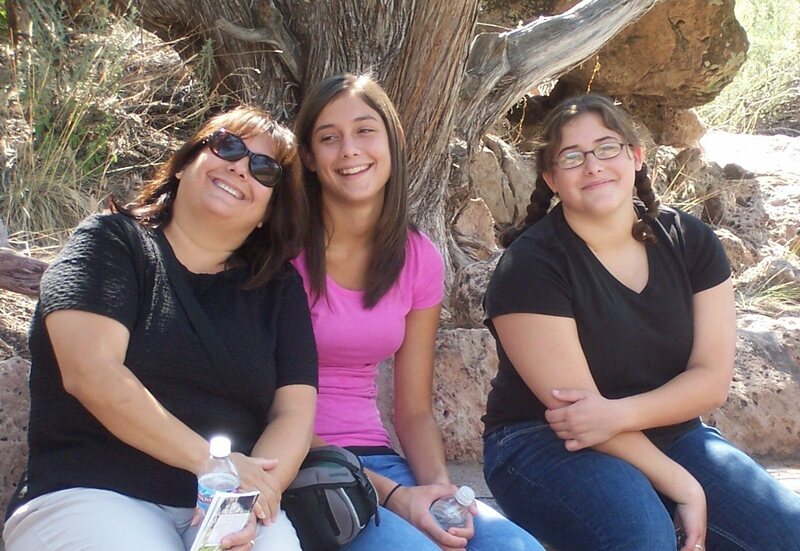 Since it was a warm New Mexico day when we visited Bandelier, we stayed in the shade of the creek-fed trees as long as possible, before braving the sun and the cliff dwellings. 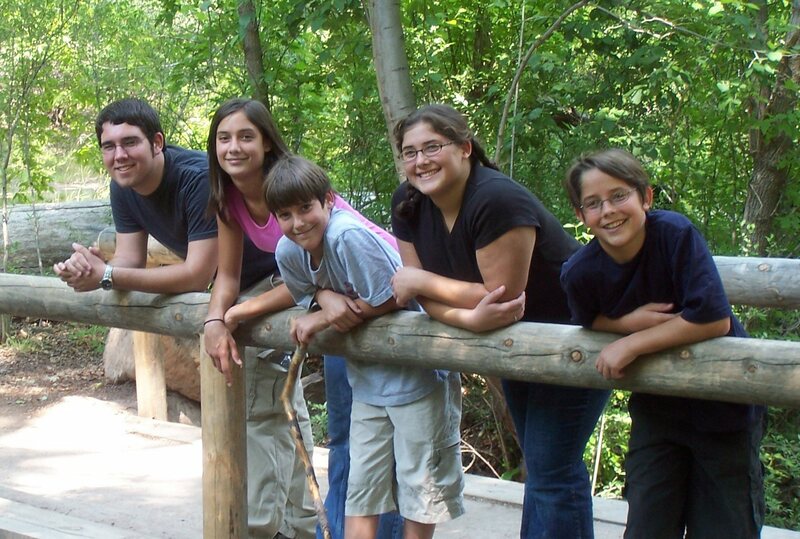 My kids had fun climbing the modern wood ladders up to the cave entrances and poking around. The caves we saw weren't very big, but I guess they were big enough to sleep in and to store some food. Bandelier was about the 8th or 9th Native American site we've visitied, the third on this trip, and I began noticing cases of Ancestro Puebloan burnout. The kids were good, but for some reason they had more fun balancing water bottles on their foreheads and leaping over streams than they did learning about in which centuries this valley was occupied and why corn, squash, and beans were so important to the farmer's diet. Funny how that is. In Santa Fe, take U.S. 285 north for about 15 miles to Pojoaque. Take State Highway 502 west for about 12 miles, then take highway 4 south for about 9 miles, through the town of White Rock, to the Bandelier turnoff. 70 miles to the east is Ft. Union National Memorial. 40 miles to the east southeast is Pecos National Historic Park. 100 miles to the south is Salinas Pueblo Missions National Monument. 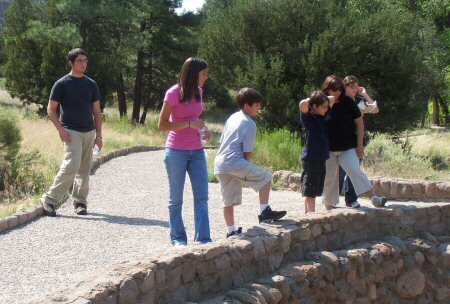 70 miles to the south southwest is Petroglyph National Monument. 100 miles to the west is Chaco Canyon National Historic Park.